I'm fixated on round or curved sofas lately. I think they make for an interesting and different living space. In my opinion they make a statement all by themselves, plus they would seem to encourage conversation among guests. Plus they have a cozy feel. Do you agree? I guess Kelly Wearstler is a fan as well. Do you like the look? Don't we all! These are so gangster. Absolutely love the shape it brings to a space! A great selection - they are such a sociable shape! 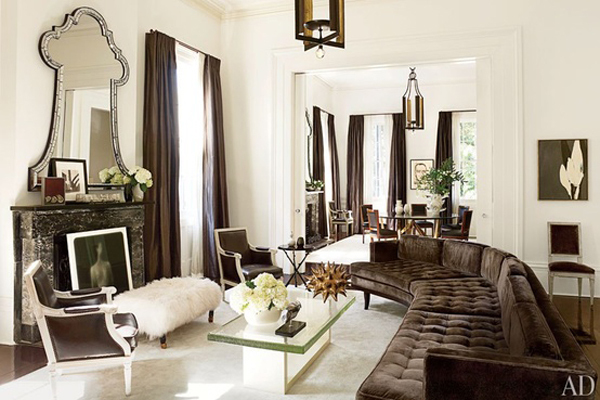 I love it, especially those two interiors featured in ARCHITECTURAL DIGEST! They are amazing! Nope...I haven't seen it. I'm always a little behind in my mag. reading. Will be sure to check it out. Wow, all the rooms look fantastic! 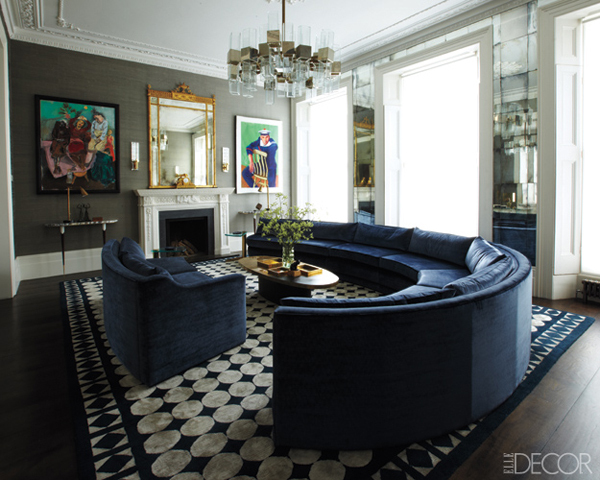 You are right, the curved sofas make the room! I like the idea of round- one doesn't feel so sandwiched in! Great photos. that's funny...Now I have that song stuck in my head. very cool! I haven't really noticed or seen round couches before, this one is great! Love the look! Only problem is need the space. If I had a place that one would work I would def rock one. I think they are posh...but I agree with Kristen...space hogs?! The curvier the better! Aren't they fab? and they make so much sense to have better conversations etc..and yet, still so uncommon? Space hogging may be the culprit as the other ladies have said. I love them too and I definitely would have one if had enough space in my little home! I love them, too. And they do look like they'd make for much better conversation! I find them very inclusive... Like they bring people together! Me too! That AD one is the vintage style I have been hunting for. It is soo hard to find, for a decent price.